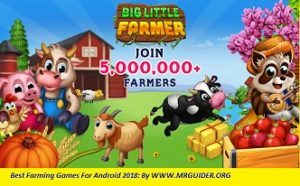 Big Little Farmer Offline Farm is one of the best farm games for Android and you can play it offline on your mobile device. Developed by Innovation Drive Studios, the creators of Real Cooking Game, it has crossed over five million downloads on Google Play Store and has 4.3 ratings. In this game, you plant crops, sell the crops for money, manage a wide range of animals such as cows, dogs, cats, hen, goats, and more. Since it is offline, has good graphics, amazing addictive gameplay, lots of fun, I would recommend you to play this farming game. 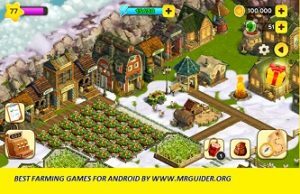 Township is a popular and one of the best farm games for Android, by Playrix Games, the creators of the homeescapes game. It was released in 2013 and still, in 2018, it is getting hits. The reason behind its constant success is the regular updates which make it evergreen and intersting. Township features all types of farming activities that should be in the best farm game; you grow crops, later process at factories, manage animals, breed animals, and you can even create clans. It is a combination of a farming game+zoo game+city-manager game. You should give it a shot if you are looking for a high-quality graphics farm game. It has crossed over 50 million downloads on Google Play Store and has 4.6 ratings. These stats are enough to say that it is the best farm game on the Google Play Store. Did you know zombies are friendly? Need proof? Then try out this fun game; In Zombie Castaways, you explore islands, grow a wide range of plants and construct buildings. It’s a mixture of adventure+city building+farming games. It features cute graphics, lots of challenging tasks, awesome content, and much more. I would recommend you to give it a shot. 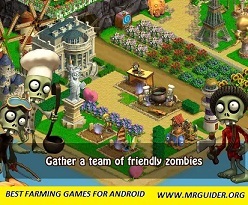 Zombie Castaways is one of the best farm games for Android. Is this game getting updates? Yes! It was released two years ago on Google Play Store and the team behind it updates it on regular basis. Klondike Adventures is a new and one of the best farm games for Android, by Vizor Apps, the creators above-mentioned game. In a short span of time, Klondike Adventures game crossed one million downloads and earns 4.5 ratings on Google Play Store. What’s unique in this game? Hempire is another one of the best farm games for Android 2018. It has just completed its one year on Google Play Store; over one million downloads, 4.6 ratings. Hempire – Plant Growing game features lots of challenging tasks, offers a good gameplay; plant, craft extracts, upgrade the equipment, deal/trade, sell products, invest, and there are plenty of in-game activities. 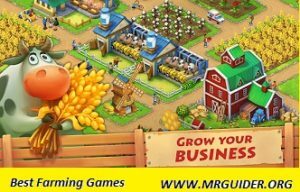 That’s why we have added it to this list of best farm games for Android. Trade Island is a new farming game for Android in which you develop your own city on a mysterious Island. But who will come on an Island to live if there are no adequate resources and facilities? Obviously, No one! You will need to build the stores, buildings, and many more facilities to attract the people. And to build all these facilities, you need resources such as wood, fruit, plastic, and much more. The game combines the farming and city building mechanics. If you are looking for a new farming game, then you should give it a try. Download – Here(Google Play Store). You can read more about this game here. Townkins is a beautiful farming game for Android, probably the best farming game on this list. There are plenty of things to do; crafting, building, designing home, fishing, cooking, trading, and much more. That’s why it is very engaging. 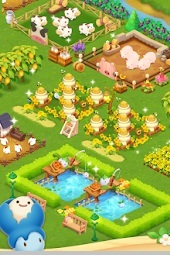 The gameplay is similar to other games; you cultivate a wide range of crops, complete orders, earn money, level up, and unlock new features such as fishing. The best thing is we can interact with other players in real-time; you can visit their farm, help them in growing crops, send them gifts. The graphics of this game are amazing. Download – Here(Google Play Store). Funky Bay is another one of the best farming games for Android, by Belka Games. Well, there is nothing unique in this game and it’s hard to level up, but still, it worth downloading as it’s quest system is quite engaging. In this game, you build factories, cultivate crops, complete the visitors’ orders, and earn money. The game also features a trading system; you can sell crops or tools in the market or purchase rare tools or items by visiting a friend’s farm. Download – Here(Google Play Store).